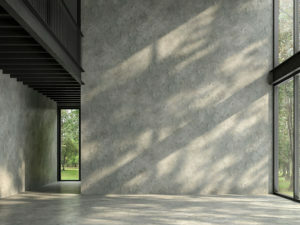 In many commercial properties, polished concrete flooring is a popular trend. It is easy to maintain, cost-effective and offers a beautiful, glossy finish. Perhaps you want to enjoy a new stain color, or maybe you dream of stained polished concrete. Whatever the case, American Flooring Removal can help make your flooring dreams a reality with polished concrete installation! We have seen a growing demand for polished concrete in the past few years. These floors continue to grow in popularity, mostly in commercial spaces such as offices or retail spaces. In any building with high foot traffic, polished concrete is a sound investment, You’ll need to schedule professional installation for the best results. But first, we must remove the old material. Our team is highly trained and equipped to remove your old flooring to make room for your new polished concrete! If you’ve grown tired of your old tile or wood flooring, then perhaps it’s time for something fresh, like stained polished concrete. The customization options are endless. But first, you’ll need American Flooring Removal to professionally install your new concrete flooring. A professionally installed concrete coating can be an economical choice for any commercial floor. It is designed to repel spills and improve appearances. For the best results, you’ll want to schedule installation with a flooring team that knows their stuff! Our team is better equipped and trained to handle any type of flooring material. With the recent rise in popularity of polished concrete, we have expanded our scope and are here to help once more! For polished concrete flooring installation in Fort Worth, please call American Flooring Removal at (469) 556-3936!